This post was originally published on Christmas 2013. This Christmas, the Chicago Bulls take on the Oklahoma City Thunder in OKC. (1:30 pm, ABC). In the NBA on ESPN/ABC era we’ve been blessed with a near over-saturation of basketball on Christmas Day to distract us from the prerequisite family activities we have to take part in or, if not that, the ball played in any given year can help us delineate certain Christmases where the presents may have sucked or your aunt didn’t bring her “A” game with the potato salad. Even if the holiday itself didn’t do much for you, you can hark back to LeBron’s clutch play over Kobe or Carmelo snapping in the fourth against Boston. 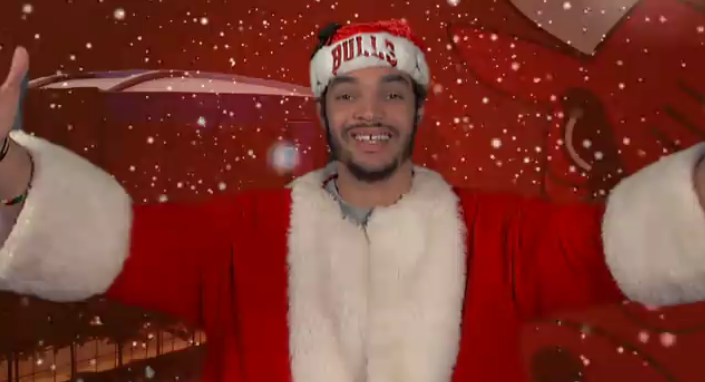 For Chicagoans of recent generations, Christmas has a particular resonance if you’re into hoops and the Bulls. As the Christmas schedule became more and more of a showcase for the NBA’s best — a more democratic version of what the NFL does with Thanksgiving — Chicago has been a part of the festivities as much as any franchise outside of the Knicks and the Lakers. Often playing as reigning champs or prime championship contenders and with one of the Association’s most recognizable figures (Mike, Scottie, D-Rose, etc. ), the NBA has made sure in most years that the Bulls have been matched up with other premier talents or franchises. That established edict allowed a certain amount of bittersweetness to creep into last year’s game in Brooklyn — you figure the league saw a chance for two of the top Eastern Conference competitors to kick the holiday games off right (we also can’t forget the residual heat from these two team’s superb first round playoff battle last season and the expectation that Rose would be up and running again) but as it stood it looked like the most “ehh” game of that year’s slate. Back to the Bulls’ holiday history: the franchise has played in 18 Christmas games, counting today’s contest, with a record of 10-7 so far. The Bulls’ first Christmas game came in the team’s inaugural season, 1966, against the Knicks, who have played more Christmas games (49) than any other franchise — the beginning of the holiday tradition, which dates back to 1947, was very much tied into New York and Madison Square Garden’s past status as the basketball mecca. Other teams even came to play each other at the Garden on Christmas as part of doubleheaders. The Bulls lost that first game 133-132, and lost again to the Cincinnati Royals in 1968 (103-98) and to the Baltimore Bullets in 1970 (128-112) before scoring their first Christmas win against Portland (109-88) in ’71. Twice more did the Bulls play on Christmas in the 70’s but a 10-year break occurred between beating the Kansas City Kings in ’76 and 1986 when, with Michael Jordan in his third season, the Bulls took on the Knicks. The Bulls fell in a close one (Doug Collins looked particularly salty) but the NBA got what it wanted — a memorable game between two of the players it was looking to help define the League for the next 10-15 years. Another short break occurred, but as the 1990’s dawned so did the Bulls’ defining era on Christmas — Chicago would play on each Dec. 25 from ’90-’94 and in all but one extending to ’97. Another game against New York was scheduled for ’98 but didn’t occur because of that season’s lockout, which pushed the season’s start into 1999. The D-Rose era has seen the Bulls go 1-2 thus far (1-1 in games he played in). The Knicks knocked off the Bulls 103-95 in 2010 but the-then 18-10 squad won 15 of their next 19 games, setting up their 62-win season that gave them the No. 1 seed in the East entering the playoffs. An 88-87 win against the Lakers a year later was far from assured, even at the beginning of that December, due to another owner’s lockout of the players that delayed the start of the ’11-12 season. But the schedule wound up kicking off that Dec. 25 and it was indeed a memorable start for another successful regular season, at least. Such hope back then, even Richard Hamilton basked in its glow. A thud of a loss at Houston in 2012 brings us closer to the present. Last season the Bulls, after a slow start which included another season-ending injury for Rose, were still in an awkward stretch, possibly weighing over whether or not to junk the season but they won convincingly in the borough of Brooklyn, made the playoffs again and now are arguably the best team in the Eastern Conference again. A year ago, such a complete turn-around was not to be expected. Last year saw the Bulls improve to 20-9 with a 113-93 win over the Lakers, who fell to 9-20 with that loss (this year is not an anomaly, in case you forgot). The good thing about Christmas: it inspires more positive thinking than most days, it also is a day that sort of stands on its own. Success today may not mean much in the big scheme of things, but it would still be memorable.